Vancouver, British Columbia--(Newsfile Corp. - December 17, 2018) - Jaxon Mining Inc. (TSXV: JAX) (FSE: OU31) (OTC: JXMNF) (the "Company") is pleased to announce that on November 30, 2018 it completed 23 line km 2D induced Polarization (IP) and ground magnetic surveys at its Red Springs project, near Smithers, B.C. Read More..
Vancouver, Canada, December 4, 2018 - Jaxon Mining Inc. (TSXV: JAX, FSE: OU31, OTC: JXMNF) (the “Company”) is pleased to announce it has received the assay results from diamond drill holes BB18-01 to BB18-03. The Company is still awaiting the assays results from holes BB18-04 and BB18-05 which were drilled at different angles, azimuths and depths from the same platform used by BB18-03. Read More..
Vancouver, B.C. November 13, 2018 — Ascot Resources Ltd (TSX.V: AOT; OTCQX: AOTVF) (“Ascot” or the “Company”) is pleased to announce that it has completed a 13,500-metre induced polarization (“IP”) survey consisting of eight profiles. The survey identified multiple high priority chargeability anomalies. Read More..
Drilling the Backbone Gold-Bearing Tourmaline Breccia Zone at the Red Springs Prospect in Fall 2018. Investors are cautioned that, except for statements of historical fact, certain information contained in this document includes “forward-looking information”, with respect to a performance expectation for Jaxon. Read More..
Sojourn Exploration Inc. Nov. 2 provided preliminary results of reconnaissance mapping, sampling and geophysical surveys on four of its porphyry copper-gold projects in British Columbia, including the Todd Creek and Oweegee Dome projects in the province's prolific Golden Triangle. Read More..
Vancouver, Canada, October 22, 2018 - Jaxon Mining Inc. (TSXV: JAX, FSE: OU31, OTC: JXMNF) (“Jaxon” or the “Company”) is pleased to announce completion of its fourth diamond drill hole, BB18-04, as part of its 2018 Phase One diamond drilling program which was designed to test the extent of the gold-bearing tourmaline breccia zone at its Red Springs project. Read More..
VANCOUVER, British Columbia, Sept. 06, 2018 (GLOBE NEWSWIRE) -- Ascot Resources Ltd (TSX.V: AOT; OTCQX: AOTVF) (“Ascot” or the “Company”) is pleased to announce that an induced polarisation (“IP” *) test survey at Premier has successfully detected known mineralization. Read More..
Jaxon Mining Inc. (TSXV: JAX, FSE: OU31, OTC: JXMNF) has confirmed a discovery of a structurally controlled body of tourmaline breccias which have been traced over 500 metres in strike length with a variable width up to 15 metres, now called the Backbone Prospect. Read More..
Simcoe Geoscience Limited Announces Director Resignation Read More..
axon Mining Inc. (TSXV: JAX, FSE: OU31, OTC: JXMNF) is pleased to announce that its first phase exploration program of the 2018 field season will commence in the beginning of June. While detailed re-interpretation and analysis of geophysics data from last year’s Fall program continues at the Max project, Jaxon will initially focus on the newly discovered Red Springs target within the same Hazelton project area, 50 kilometres north of Smithers in the Skeena Arch of British Columbia. 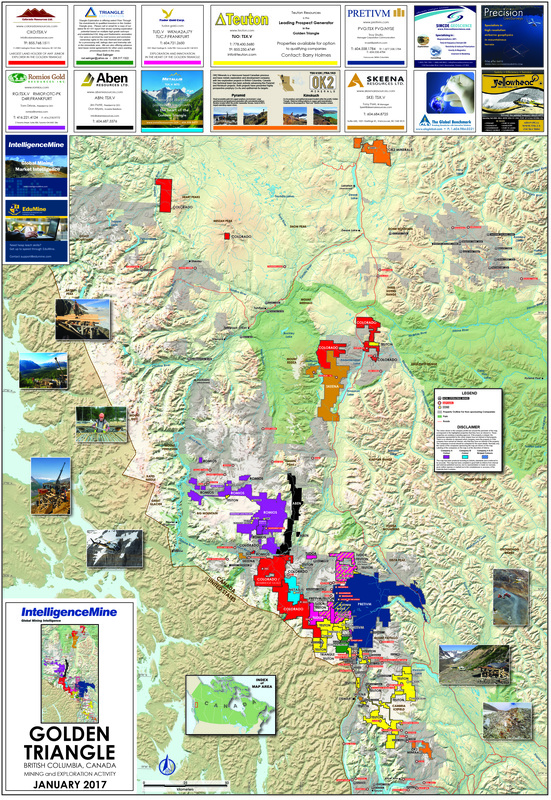 Read More..
Vancouver, BC – April 25, 2018 – Tudor Gold Corp. (TSXV: TUD) (FSE: TUC) (the "Company" or "Tudor Gold") today reports that it is incorporating a new, integrated scientific approach to understanding the mineralization at its Treaty Creek property in the Golden Triangle of north-western British Columbia. Read More..
Vancouver, BC – December 13, 2017 – Tudor Gold Corp. (TSX.V: TUD) (Frankfurt: TUC) (the “Company” or “Tudor Gold”) is pleased to report on results from hole CB-17-24 from its 2017 drill program in the Copper Belle zone of the Company’s Treaty Creek property in north-western B.C. Read More..
April 4, 2017 - Vancouver, British Columbia: Tudor Gold Corp. (TSX.V: TUD) (Frankfurt: TUC) (the “Company” or “Tudor Gold”) is pleased to provide an update on the development of its 2017 exploration program on the Treaty Creek project. Read More..
Golden opportunities in Northwest BC. Read More..
"The complete results from CB-16-03 confirm our belief that Treaty Creek holds the potential to host significant gold mineralization and validates our exploration model. To date, we have successfully hit gold mineralization down to 717 meters downhole and have encountered nearer to surface gold mineralization like the 1.12 grams gold per tonne over 54 meters starting at 88 meters downhole, which opens up the targeted area." Read More..
VANCOUVER, BRITISH COLUMBIA--(Marketwired - Dec. 22, 2016) -Tudor Gold Corp. (TSX VENTURE:TUD)(FRANKFURT:TUC) (the "Company" or "Tudor") is pleased to report on its 2016 Treaty Creek field exploration program. The exploration program achieved three goa Planning, development, and commissioning of the physical infrastructure needed for an exploration program, Completion of a Magnetotelluric (MT) survey on a portion of the property, and Diamond-drilling. Read More..
CARDSTON, ALBERTA--(Marketwired - Oct. 12, 2016) - American Creek Resources Ltd. (TSX VENTURE:AMK) ("American Creek") is pleased to report that Tudor Gold Corp. ("Tudor") has discovered a new gold zone at the Treaty Creek JV Project located in BC's "Golden Triangle" immediately north of Seabridge Gold's KSM project and in the same region as Pretivm's Brucejack project. The new gold zone was intersected in the third hole (CB-16-03) of the 2016 drilling program and is located approximately 870 meters northeast of the Copper Belle zone (drilled in 2007 and 2009). The hole was drilled into a target identified by the magnetotelluric survey (MT survey) which was completed earlier in the 2016 field season. Read More..
Simcoe Geoscience is pleased to announce the offering of Information Technology services through its sister company "Simcoe IT Limited". August 24, 2016, Vancouver, BC: Teuton Resources Corp. (“Teuton”) (“TUO”-TSX-V) (“TFE”-Frankfurt) (“TEUTF”—OTCBB) is pleased to announce that a magnetotelluric (“MT”) survey is under way at its Del Norte property, located east of Stewart, BC. Simcoe Geoscience Ltd. has been contracted to manage and interpret the survey using Riaz Mirza, a senior geophysicist, the same person who interpreted MT surveys for Seabridge Gold on their KSM property and for Pretium Resources on their Brucejack property. Simcoe is also managing and interpreting a very recently completed MT survey on Teuton’s joint ventured Treaty Creek property for Tudor Gold and also on Teuton’s farmed-out Orion property, also for Tudor Gold. All properties are within the Golden Triangle region of northwestern British Columbia. Read More..
American Creek Resources Ltd. (TSX-V:AMK) ("American Creek") is pleased to report that its JV partner, Tudor Gold Corp. (TSX-V:TUD) ("Tudor") has commissioned a comprehensive Magnetotelluric survey (“MT survey”) on the Treaty Creek Property located immediately adjacent to Seabridge Gold’s KSM project in the "Golden Triangle" of NW British Columbia 75km north of Stewart. American Creek and Tudor recently entered into a joint venture agreement with Tudor holding a 60% interest and American Creek and Teuton Resources Corp. each holding 20% carried interests in the project. Tudor is the operator. The survey, already in progress, is being run by Simcoe Geoscience Ltd. using the same geophysicist that designed, ran, and interpreted MT surveys on the adjacent KSM and Brucejack projects owned by Seabridge Gold and Pretivm Resources respectively. The program is also using the same equipment and technology Read More..
A Magnetotelluric ("MT") Geophysical Survey managed by Simcoe Geoscience is underway on the Company's Treaty Creek property. The MT survey has been designed to cover favorable areas identified by previous drilling and geophysical programs. The survey should provide a reliable subsurface resistivity image and has been undertaken due to the successful application of the technology in the area. The first priority is to extend the known results of a previous MT survey collected in 2010 Read More..
August 3, 2016, Vancouver, BC: Teuton Resources Corp. (“Teuton”) (“TUO”-TSX-V) (“TFE”-Frankfurt) (“TEUTF”—OTCBB) is pleased to announce that diamond drilling is set to begin within the next few days on the Treaty Creek Project, a joint venture between Teuton, Tudor Gold and American Creek. Pursuant to the joint venture agreement announced on May 11, 2016, Teuton holds a 20% interest in the Treaty Creek Project, in addition to a 2% NSR on 49% of certain claims within the property and a 1% NSR on 49% of other claims within the property, without a buyback. Teuton’s 20% interest is fully carried during the exploration period until a production notice is given, meaning that it will not be required to put up any funds during this period. Tudor Gold has reported that a magneto-telluric (“MT”) geophysical survey managed by Simcoe Geoscience is underway at Treaty Creek. The MT survey has been designed to cover favorable areas identified by Read More..